Slowly but surely, Apple (s aapl) is trying to convince more media companies to play in its sandbox, and the latest move is an iBooks-style digital newsstand for the iPhone and iPad. As part of the raft of new features and services it announced at its annual Worldwide Developers Conference on Monday, Apple launched Newsstand — a single interface for all of a user’s subscriptions to newspapers and magazines. Whether the new offering will convince more publishers to sign up and hand over 30 percent of their subscription revenues to the company remains to be seen. Apple has been working on a single digital newsstand for newspapers and magazines since last year, but it ran into some significant roadblocks with several publishers. 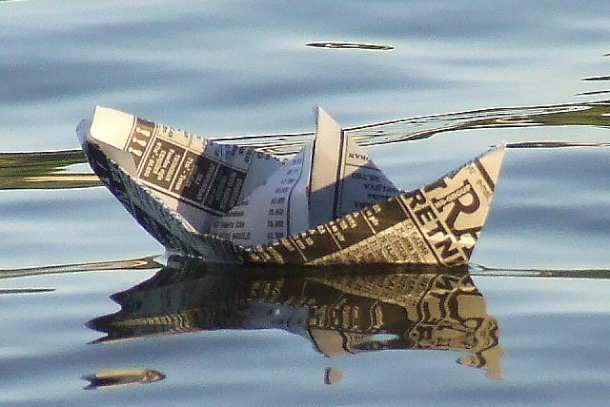 One issue was the control over subscriber information: Some media companies didn’t want to have to ask their readers to give up personal details, but they wanted direct access to that info the same way they have it with print subscriptions —since it is a crucial part of their sales pitch to advertisers. Apple stood firm, however, and eventually a number of mainstream publishers started to cave in to the company’s demands. As my colleague Darrell Etherington has noted in his coverage, Condé Nast has recently signed up to offer digital magazine subscriptions for a number of its properties, including Wired, Glamour and Vanity Fair, and Hearst (publisher of Esquire) has also signed up to offer subscriptions (Time Inc. (s twx) is one of the few remaining holdouts). And contrary to what some publishers feared, a surprisingly large proportion of users seems to be fine with providing personal info through an app. With the launch of the new Newsstand, all of a user’s newspaper and magazine subscriptions will be available in a single interface, the same way that books are available through the iBooks interface. 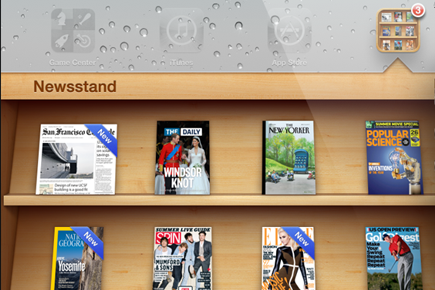 The design of Newsstand even looks the same, with the wood-style virtual shelving similar to a bookstore or magazine store. Newsstand completes the transition of magazine and newspapers away from just being apps in the traditional iTunes app store and toward actual subscriptions in the home. When publications were first offered on the iPhone and iPad, users had to pay for each individual issue of a magazine and then download it separately. Now, with Apple’s support for in-app purchasing, subscriptions for Wired or the Daily or the New York Times will automatically be updated every month without requiring users to do anything. The biggest issue for publishers, however, is that dealing through the Apple ecosystem still means they have to give Apple 30 percent of their subscription revenue. Some publishers were getting around this by sending users to a website outside their app in order to sign them up for a subscription, but Apple closed that door last year by requiring any publisher who charges for content to do so from within the app as well as outside it. Condé Nast and Hearst seem to feel that giving Apple that kind of control over their access to a subscriber base — not to mention 30 percent of their revenues — is a fair trade. But is that a sign of how compelling Apple’s offering is or how desperate publishers are? Tightening their grip? I don’t think publishers caved in any ways; they realized that they need to change how they operate. This may almost single-handedly re-vitalize and/or “save” the floundering newspaper and magazine industry. Yeah, something about the words “tightening its grip” just didn’t sit right with me, and casts a completely negative shadow over what is otherwise great for consumers. No one cares about your articles. This is the way it should have been done from the start. I hate magazine apps. Makes more sense, and I’ll probably actually use it now. OMFG …. WTF… Apple want 30 percent for all newspapers/magazines/books……… and music , movies , tv etc…. I will just setup a Direct Debit now , for 30% of everything I earn. Soon Apple will own iAir & iWater so I will have to do it anywayzz.. Apparently, for you, there is no markup at the brick&mortar stores where you buy, or restaurants, or car repair, cabs, tow services etc? All retailers charge overhead, and many newsstands and wholesalers charge more than Apple’s 30%. As for Apple tightening it’s grip, publisher’s are free to go the app.publication.com route like the Financial Times has done. Either way, Apple gets more people reading, which must be a good thing for newspapers and magazines, right?